The University of Louisiana at Lafayette is one among 20 teams chosen worldwide to compete in the U.S. Department of Energy’s Solar Decathlon. The international design and building competition will feature teams from Cornell, Darmstadt Germany, Virginia Tech and Penn State among others. Thirty-nine universities submitted proposals for selection. 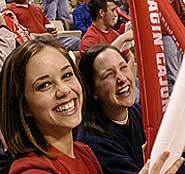 UL Lafayette’s team is the BeauSoleil team. “ Every now and again, a project comes along that has transformative powers. This is one of them,” said Dr. Gordon Brooks, dean of the College of the Arts. Teams must design, build, and operate an attractive, effective, and energy-efficient solar powered house. The inaugural Solar Decathlon was held in 2002, and the most recent competition was just completed in the fall of 2007. In late September 2009, teams from around the world will join the competition's organizers and sponsors in Washington, D.C., to assemble a "solar village" on the National Mall. The U.S. Department of Energy's (DOE) Office of Energy Efficiency and Renewable Energy is the primary sponsor of the Solar Decathlon. The BeauSoleil team represents a collaboration between the UL Lafayette School of Architecture and Design, the College of Engineering and the College of Business. Architecture, design, business and engineering students along with Louisiana System Built Homes and other community partners will design and build the BeauSoleil Louisiana Solar Home over the next two years. “ The BeauSoleil Louisiana Solar Home embodies the ideals of many diverse interests: sustainable ‘green’ design, affordable housing, the promotion of Louisiana culture and hurricane rebuilding to name a few,” said Dr. Geoff Gjertson, team coordinator and assistant professor in Architecture.